It’s been a whole year, fam! One year ago this past weekend, I married my college sweetheart. We’re also celebrating 7 years of being a couple, because we’re cheesy and got married on our anniversary. It’s a day we remember full of joy and great stories. And now, as some of my best friends are becoming engaged and start planning their own weddings, I’ve also been looking back on the planning process. Don’t get me wrong: I absolutely loved wedding planning. Full of excitement and anticipation, it was the ultimate project for a life-long planning and organization freak like me. No matter how much planning you do, though, the actual wedding day will have surprises in store. 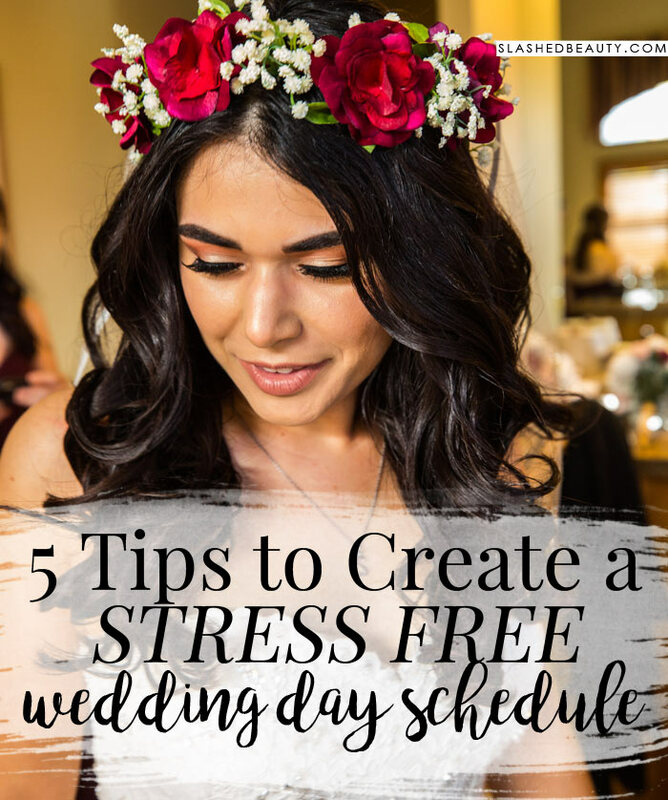 So as I reminisce own wedding day, I wanted to share some of the wedding planning tips that helped me create a wedding day schedule that was as stress-free as possible… and the tips I wish I had done, but didn’t. 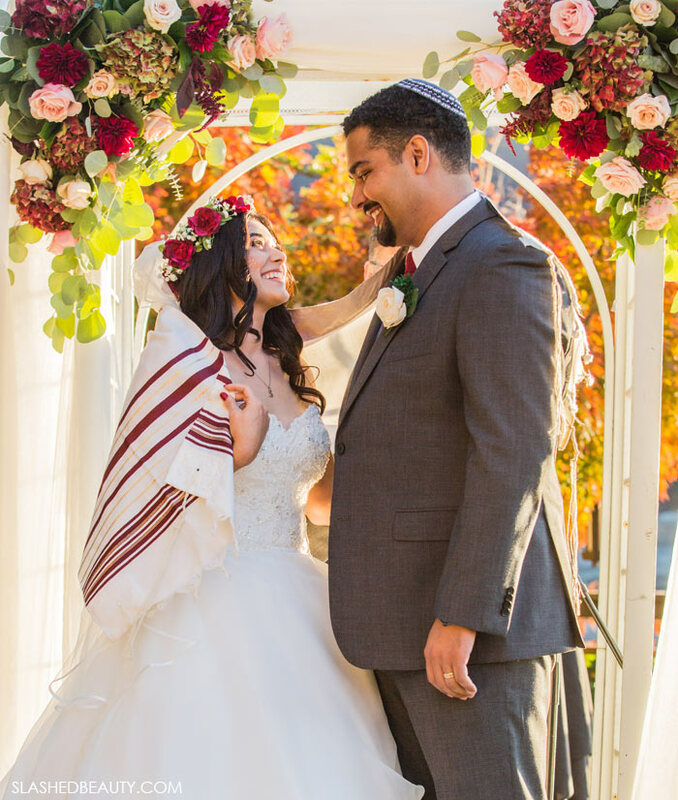 If you’d like to take a look back at our big day, check out my post here. When it comes to the reception, you will most likely work out an order of events with your DJ and they will take it from there. Your main job from then on will be to have fun and enjoy the night surrounded by people you love! You may not have have to do any decorating yourself if vendors have been hired to do everything. However, we saved money by DIYing several decorations for our reception room, such as centerpieces, table numbers, name cards, and a photo booth. This meant that it was our responsibility to actually set them up, too. Luckily, there was no event scheduled for the day before our wedding, so the venue let us in on Friday to set everything up ahead of time. This took a lot off our plates for the day-of, as I knew everything was ready and I was able to have a look at the set up and give final approval. I highly suggest checking with your venue if it will be empty the day before and allow you to set some things up early. Yes, it’s going to be a long day. I suggest going to sleep earlier instead of sleeping in, because I wish that I had started my day earlier. I had the girls meet me to start getting ready at 10AM because I figured everyone could enjoy their morning and get in the right mindset for what was ahead. However, I was doing my own hair and makeup which I obviously took my time on to get just right. If I had been ready earlier, we could have started photos earlier and in general would have been a little less rushed leading up to the ceremony. 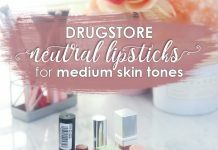 Plus, there can be little surprises that pop up on the wedding day that could throw off your schedule whether it be wardrobe malfunctions, weather, or MIA wedding party members. Always have a margin for something to go a little haywire so it’s not as big of a deal when the schedule shifts a bit. I am so preachy when it comes to this, and I’m thankful every day that we decided to go this route. Forget the whole he-shouldn’t-see-you-in-your-dress-before-the-ceremony superstition and take photos before the ceremony. You can still get a really emotional and sweet first look moment on camera, and you will be so happy to have the extra time to stage gorgeous shots. We carved out two hours before the ceremony to take photos, and I feel like it still wasn’t enough. We ended up missing a few crucial set-ups (like the entire wedding party together). With that said, I also recommend giving your photographer a list of photo set-ups you want, and ask them how long you think you’ll need… then add about 45 minutes. We were so grateful that we got most of our shots ahead of time, especially because it was around daylight savings time and the sun was due to set earlier. We still took a few more sunset shots after the ceremony, but we were able to have a little downtime before our grand entrance to just decompress. Even if you don’t have a wedding planner, most venues include a day-of coordinator to help things run smoothly on your actual wedding day. My coordinator at The Pines resort, Jessica, was a godsend— she was always five steps ahead of everything and truly pulled the day together. Even as a meticulous planner, once the big day arrived, my brain kind of turned to mush. 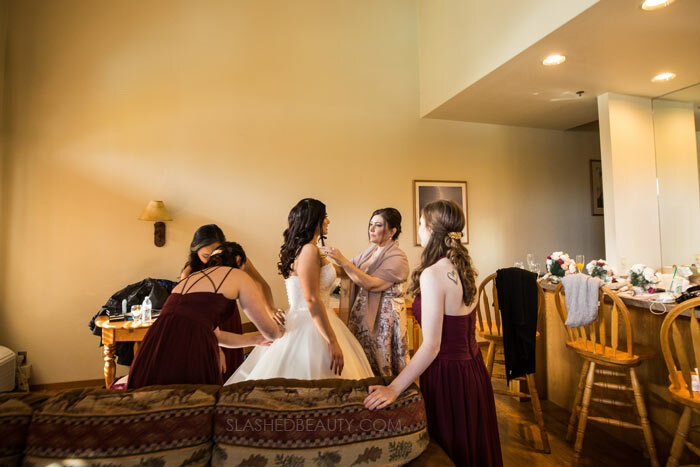 I was just focused on getting myself ready and in my dress, and Jessica made sure that all the little things were being taken care of and that everyone was on schedule (I gave her a copy of my itinerary!). If your wedding venue doesn’t come with a day-of coordinator, designate a trusted friend or family member outside of the wedding party to be somewhat of a time manager. Their job will be checking in on everyone involved to make sure tings stay on track. I already said it once in this post but I’ll say it again. No matter how carefully you plan, there will likely still be hiccups. At the end of it all, you’ll have to go with the flow and prioritize enjoying yourself and making memories! For more wedding content, check out my other posts here. Do you have any other tips on how to create a wedding schedule? Leave them in the comments!